Known for our small student to teacher ratios, we pride ourselves in providing children with a strong curriculum and a teaching staff that works cohesively as a unit. Our teacher to student ratio in our two year old class is 1:6 and in our three's class is 1:8. We celebrate over 25 years teaching children ages 2 through 5 in a warm, nurturing environment using developmentally appropriate practices. You will be working with an experienced co-teacher and will have the opportunity to develop and expand your weekly curriculum. You will work with goals designed by our curriculum director, to give you a curriculum framework. Our teachers work in a well equipped, positive classroom environment and use a Handwriting Without Tears curriculum and the bucket filling social emotional program. Teaching at Acorn offers you the freedom to advance your skills with the help and guidance of management. Acorn provides teachers with many benefits including a full paid week off at Christmas, paid holidays, vacations, and sick time. In addition, teachers have the option of taking advantage of medical and dental benefits, a competitive 401k program, and staff childcare discounts. 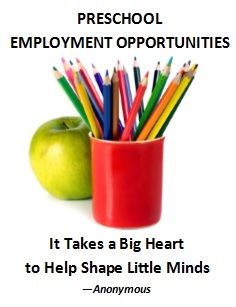 With over fifty staff at our three schools, we are looking for teachers interested in substituting. You do not need to have experience to substitute and it is a great way to enhance your skills and work with a variety of ages.